Lesley Batchelor OBE is an expert on international trade and a passionate champion of UK exporters. She is also the Director General of the Institute of Export, the professional membership body representing and supporting the interests of everyone involved in importing, exporting and international trade. In this article, she explains how to use the Boston Consulting Group Product Matrix to prioritise your international offering. When starting to sell internationally it is very tempting to simply translate your entire website and go for it with your all of your offerings. However, there is a very good argument to look at what’s already selling well and sell those first. The reality is that you have to prioritise which offerings you’re going to sell because not all of your products are going to succeed overseas in the way they may do at home. For example if you, have a product or service that needs additional support after the sale has been made, this is going to become more costly if you are having to travel to support that sale – this wouldn’t just add the cost of the travel but also the cost of your time out of the office. Therefore leaving out the products that cause additional and sometimes unquantifiable costs out of your initial international sales offering makes sense. 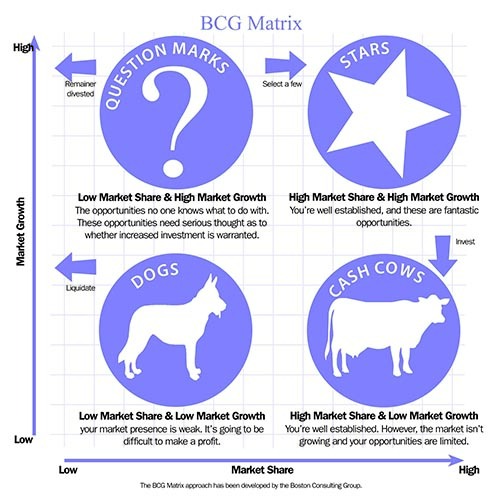 In business modelling terms we use something called the Boston Consulting Group Matrix and this offers us the chance to place our products individually into one of four categories – Cash Cows, Stars, Question Marks, and Dogs! Needless to say you don’t try and sell the last two, though in the UK a dog isn’t necessarily a bad thing – maybe Americans are different to the animal loving Brits! Plotting your offerings in the above chart to see which categories they fall in will help you to prioritise appropriately. It will also help to ensure that entering a new international market is not complicated by the difficulties you already have in the UK, preventing you from damaging your reputation and margins your new market. The Institute of Export & International Trade’s International Marketing Bite-Size Chunks have a wealth of knowledge that you need while working in a foreign market. Choose between six topics covering market segmentation, strategy generation, planning issues and more, best suited to your needs.